Justice Ranjan Gogoi was sworn in as the 46th Chief Justice of India on Wednesday, 3 October 2018. 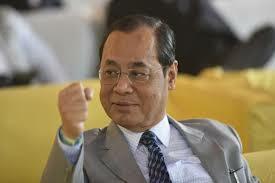 The 63-year-old succeeded Justice Dipak Misra. The oath was administered by President Ram Nath Kovind at a brief ceremony in Rashtrapati Bhavan’s Darbar Hall in New Delhi. The newly sworn-in Chief Justice of India Gogoi will have a tenure of a little over 13 months and would retire on 17 November 2019. Gogoi, after being sworn-in, said that the practise of mentioning for out of listing cases will stop and will not be entertained by him in the ordinary course. He also said that exceptions will be made only in cases with the urgency of getting killed, evicted or hanged the same day.